What are my options in working with you? Please see my page at this link: Work with Me. Do you only do collaborative work or can I commission you for an individual project? I work on both individual and collaborative projects. What topics do you focus on when speaking? I focus on a variety of topics including: Creativity and Innovation in Organizations, How Art Inspires Change, and The Power of Art. We can work together to discover the focus that best meets your needs. 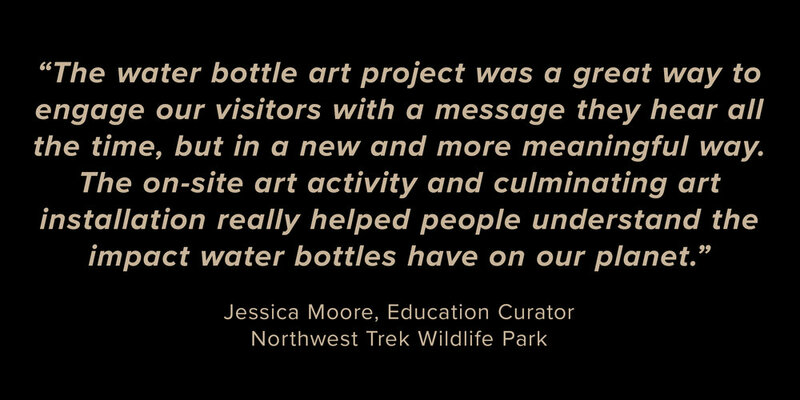 What will my conference or event gain by having you present and create an onsite collaborative art piece? The attendees at your event will immediately feel centered and connected to one another. They will each make an accessible art piece that will contribute to a large installation. Throughout the event, they will witness the art installation come together. This mirrors the learning and community building happening at the event. 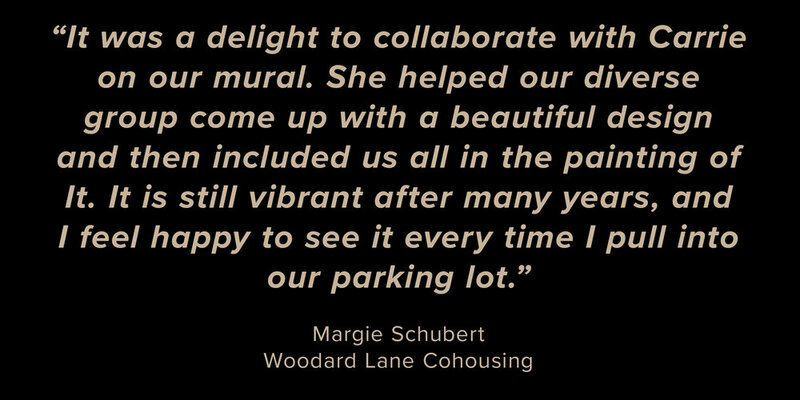 The completion of the art installation will be a visual representation of their experience. You will gain a more engaged, connected audience, a visual representation of your event, and more excitement for your next event. The entire process will enliven your conference. I will work with you to seamlessly integrate this collaborative art into your event. We will design the art in a way that brings your conference theme to life. This is a great way to engage with social media. People will be inspired to take photos of the art they were a part of making and share them online. Images get more likes than words alone. 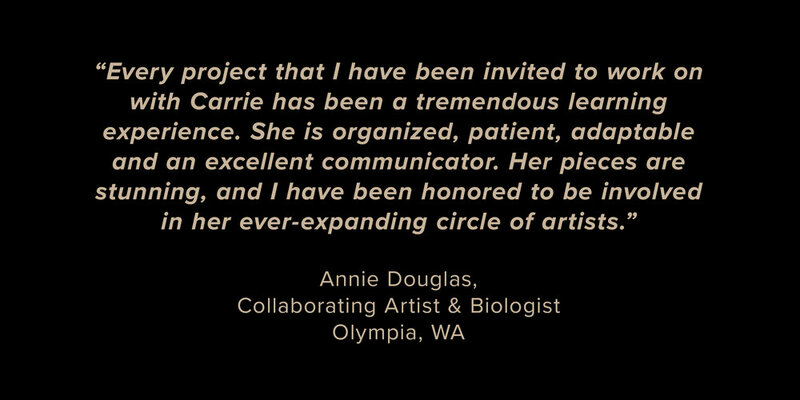 I am based in the Pacific Northwest and travel for selected events, workshops, and projects. I offer varying price structures depending on the time and materials involved. Projects can be scaled to meet your needs and your budget on a case by case basis. Do you do work pro-bono or for the exposure? I offer a sliding-scale fee structure for 501(c)3 nonprofits and schools. If there is an opportunity that matches up with my mission and audience, and money is an issue, I will consider offering a deeply discounted rate. Will you visit my school or classroom? 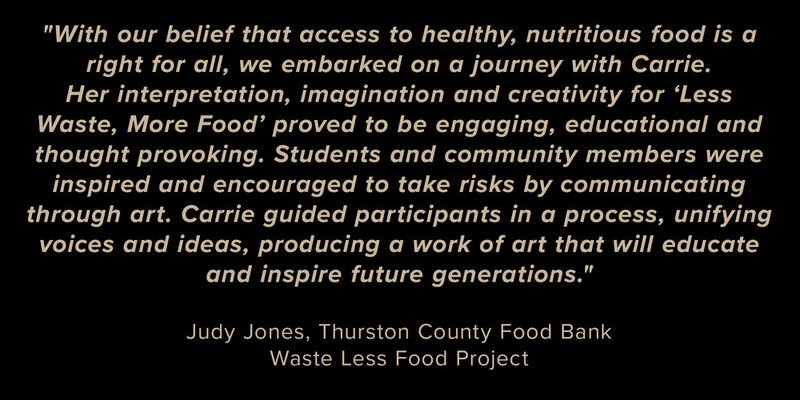 When I partner with organizations to do large-scale Art in Action Projects, I often collaborate with classrooms and schools. If you would like to be notified about future projects, sign up for my newsletter. I send out emails when I am working on projects with opportunities to engage. I rarely visit individual classrooms unless I am contracted to give an artist talk or work on a project. I want to create my own collaborative art project. Will you tell me how? That’s great! There are many ways to go about this. I occasionally offer my services as a consultant and charge a consulting fee for this work. Do you have small items for sale? Not at this time, but thanks for asking! If you don’t find what you’re looking for here, let’s talk! Give me a call or drop me a line and we can set up a short conversation to see if we are a good match. Where can I see your public art in person? You will find the public exhibitions listed below with addresses and links to a map for each. Please call schools in advance to view an installation inside or outside of a public school. Click on any photo to be taken to that project’s Gallery page. Interior hanging installation made from hundreds of individually designed pieces. LOTT WET Science Center, 500 Adams St NE, Olympia, WA 98501. Open 10-4 Monday – Saturday, Free admission. Exterior sculpture and pollinator garden. Avanti High School, 1113 Legion Way SE, Olympia, WA 98501. 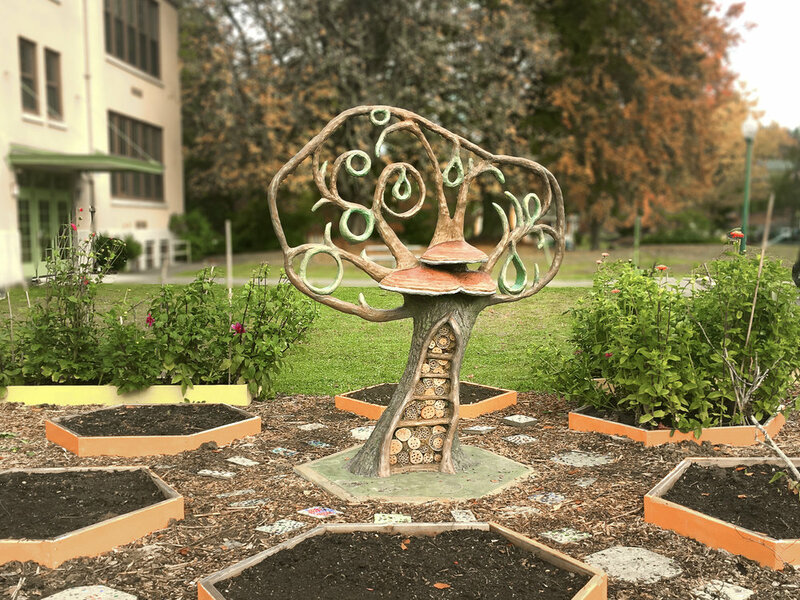 The sculpture is located in the back of the school, off of Legion Way SE. See the hundreds of pacific herring shimmer in the light, while listening to the chiming of the ceramic shells. Each piece was uniquely crafted by a student at the school. Sherman Elementary School cafeteria, 4415 N 38th St, Tacoma, WA 98407. Call 253-571-5488 for permission to view. The microscopic becomes macro in this mural featuring plankton of the Puget Sound. 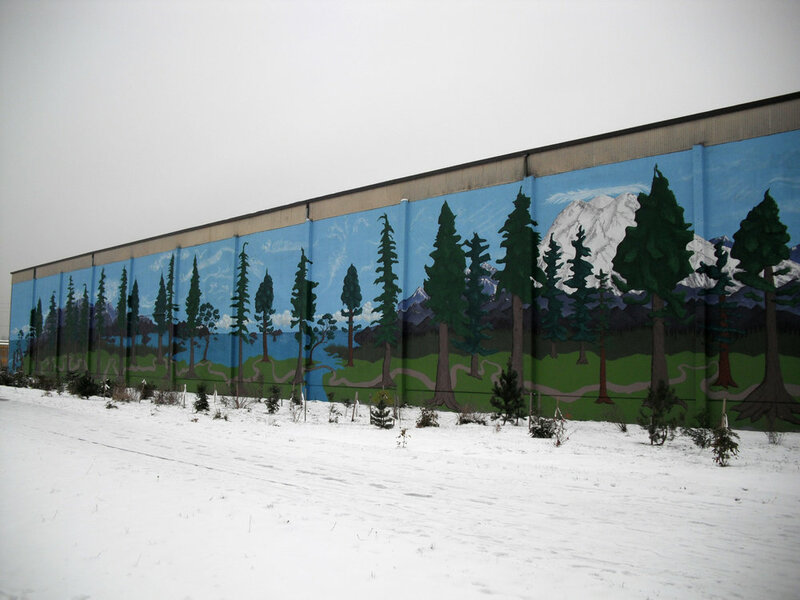 The Puget Sound Estuarium, mural located on the side of Carras Cabinets Inc., 307 State Ave NE, Olympia, WA 98501, next to Old School Pizzeria.